It isn’t just a cliché—there are two sides to every story, and for CME directors, it’s critical to have a clear view of every angle of your data. That’s because your team needs an accurate portrait of current learner outcomes to build successful educational strategy—one that is based on the diversity of your learners’ educational needs and goals, not guesswork. Data access is key to the creation of impactful, evidence-driven learning experiences, and the use of “clean” program and user data is the first step in developing a successful educational model. With combined data assessment, EthosCE Analytics automates data management, eliminating human error risks and data gaps. 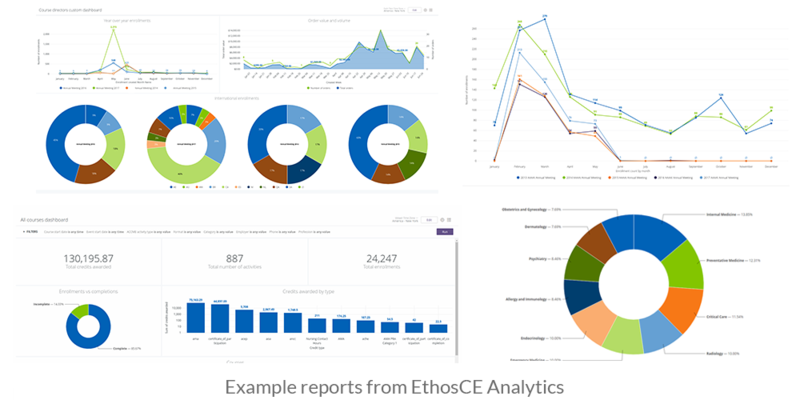 EthosCE Analytics is a robust analytics suite that gives CME directors complete control over their critical program data. CME directors need an aggregate view of learner assessment data to determine patterns in learner behaviors and the impact of curriculum changes on educational outcomes over time. How are your students performing course-by-course and site-wide? How are specific groups of learners meeting their educational goals? Are there content issues preventing your users from completing activities in an efficient manner? Do students experience LMS usability issues that interrupt the learning experience? How do specific content within activities impact learner knowledge retention? Are students meeting their self-identified educational goals? Combined data assessment allows you to view all of your critical data at once through a series of customizable dashboards in your LMS admin. That means there’s no need to cut and paste statistics from a seemingly never-ending email chain or take notes from a 20-page report and hope you haven’t forgotten anything. With combined data assessment, you can identify key patterns in your data—such as a dip in course completion rates after a change in activities content—in minutes just by viewing your dashboard—not weeks. You will also have full access to historical and real-time program data from the same dashboard, allowing you to pinpoint potential issues and create solutions before problems become overwhelming. Human error is common when CME learner assessment information is compiled manually—with so much data to work with, it’s nearly impossible to scrape and maintain clean data by hand. 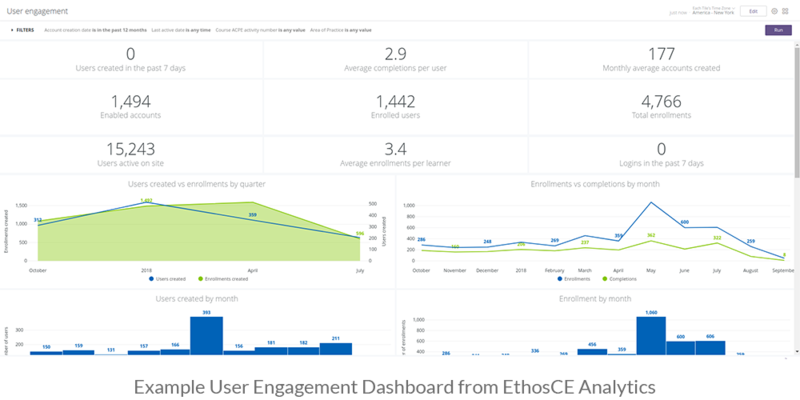 With EthosCE Analytics, not only is it easy to view all relevant learner data at a glance, it’s also effortless to collect your most important insights. Our platform automates data collection, warehousing, and analytics—you won’t have to wrangle multiple spreadsheets to find a specific dataset or review an insight from a few months (or years) back. Why is it so important to automate your data management processes? Because policy created based on insights that are derived from incomplete data can result in poor resource allocation and curriculum content that fails to address users’ needs. Combined data assessments eliminate the need for “guesstimates” on your program’s educational impact or the quality of learner outcomes over time. With EthosCE Analytics, all of your data isn’t just accessible, it’s also incredibly easy to manage. Look at demographic slices within the context of your program’s unique characteristics. For some courses or programs, some demographic details—such as the region that your high-performing students hail from—may be less important than other factors—such as the fact that most of these students study via mobile—when creating datasets. If focusing on LMS usability, for example, look at program-wide learner mobile usage and monitor LMS usability feedback for these students as well. Review relationships between learner performance data and activities content changes over time. When looking at the possible impact of changes in your curriculum on learner performance, it’s important to view a wide sample of data and not just the short-term impact of the new content. Take a look at the impact of earlier curriculum changes on learner performance if your learners are experiencing poor assessment scores on new material. There may be an issue with the way new content is introduced or with the self-help resources within your activities, and not the content itself. Take a deep dive into user feedback and use these insights to segment learner groups. Learner feedback should always serve as a guide for your data segmentation. Look for top areas of concern in your learners’ submitted feedback and help ticket requests and use these issues to guide your data review. Users asking for help repeatedly with LMS usability issues should be targeted for outreach as they may be at risk of dropping out of their courses. Learners who are high-performers but whom are consistently expressing dissatisfaction with activities content may also be considered as within this group. Advanced data visualizations streamline the creation of reports, allowing users to generate graphic summaries of complex insights with a few clicks. Our advanced data visualizations are comprehensive, elegant, and user-friendly—making complex reviews of historical data and advanced metrics easy to understand and viewable in seconds. EthosCE Analytics also allows you to set up instant alerts which notify stakeholders when there is a change in a dataset. That mean your entire organization can stay up-to-date on program status automatically, even when it isn’t time for a quarterly report (or a lengthy email). Data visualizations and notifications allows CME directors to view educational outcomes in real time and create proactive educational strategy. The takeaway? EthosCE Analytics removes complexity from the data management and analytics, empowering you to focus on long-term program growth. For more than 16 years, EthosCE has helped CME directors craft exceptional educational experiences for their learners. With ongoing, exceptional support, a comprehensive analytics suite, and a purpose-built CME LMS, EthosCE is the only platform you will ever need as your program grows. Learn to assess your data effectively and see how EthosCE can help you with a 1-on-1 walkthrough today!